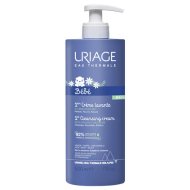 DESCRIPTION: Soin Péri-Oral from Uriage is a restorative cream for the contour of your baby's mouth. Formulated with Uriage Thermal Water, the patented complex TLR2-Regul, Gluconate of copper and zinc, silicates and polydecenes and Aloe Vera soothes irritation and redness, limits the bacterial flora and repairs the skin's protective barrier. Hypoallergenic and non-comedogenic. Without perfume. -71% of redness. * * Study carried out under pediatric control on 29 children. Clinical studies. Apply 2-3 times on the area to treat, clean and dry.